This goes without saying, but we’ve all been there – booking last-minute flights can empty your wallet before you’ve even reached your destination. Why not put the money you’ll save by booking early, into a piggy bank for your trip. 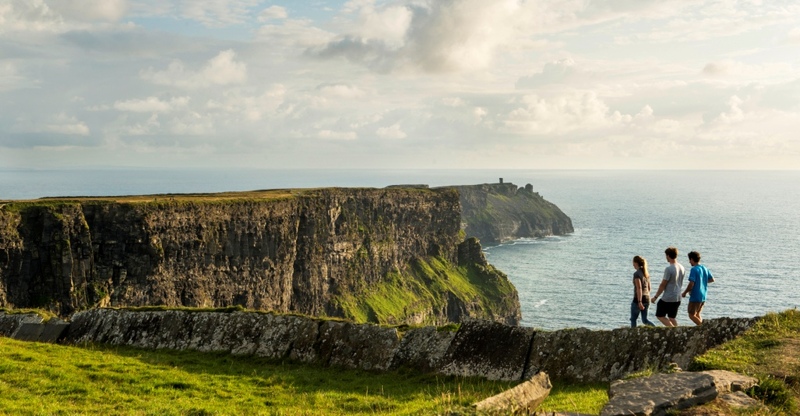 You’ll be glad you have the extra euros to experience everything Doolin has to offer such as activities and sightseeing, food, music and culture, local crafts and more. Have you heard of the familiar term ‘Book direct for the best rates’? It’s no lie. Before booking your accommodation on the major travel sites such as Booking.com and Expedia, check out the accommodation’s website – more often than not, booking directly through the accommodation host is much cheaper than booking through an agent. It’s a no-brainer! View a list of accommodation in Doolin. With so much to see and do in and around Doolin, you’ll be glad you visited for a few days rather than for a flying visit. Doolin is a hub of activity and a great base for exploring the Wild Atlantic Way, the Burren, County Clare, Galway, and more. Shannon Airport is also the closest airport to Doolin, approximately a 1-hour car journey away. If traveling by public transport, a regular bus service to Doolin from all over Ireland is operated by Bus Éireann. Here are our suggested itineraries for a holiday in Doolin. Try to do something you’ve never done before! Surf the waves, rock climb in the Burren or kayak around the scenic coastline with your friends or family. A new year, a new you! Here are some ideas for your next challenge. Yes, the Cliffs of Moher are a must-see but don’t forget to venture off the beaten path on your adventure and explore some of Doolin’s hidden gems. You won’t be disappointed! Check out some of Doolin’s hidden gems here. Fresh fish and seafood are caught within 1km from the village – you can’t get better than that! Most of Doolin’s eateries serve fresh seafood and the ‘Catch of the day’. Be sure to experience the fresh lobster, crab and seafood chowder. Also, the Burren was named the ‘European Destination of Excellence’ in 2015 for Tourism and Local Gastronomy – check out The Burren Food Trail during your stay. Doolin is a busy spot in the summertime, be sure to make dinner reservations in advance. Explore dining in Doolin here. The people are what make a place, and that says a lot about Doolin. A warm welcome and a smile await you. Don’t be afraid to talk to some of the locals while on your trip – we’re a friendly bunch! And we each have a passion for our local area, so we’re happy to share our knowledge of Doolin, its history and our recommendations for where to go, what to do, where to eat and much more. There are 2 tourism offices located in Doolin, or simply ask a stranger as you go about your day in Doolin! Doolin is well-known for its music scene, with some of the biggest names in Irish traditional music and folk music, playing in the many pubs and venues around the village. It’s not all about the music though! There are some great events popping up every year with a focus on food, surfing and adventure, fundraising, writing, craft-making, and many more. Stay up to date with upcoming local events by regularly checking our website’s event page here. This is Ireland – it’s beautiful, it’s green.. and it’s rainy. Doolin is located on the Clare coastline, along the Wild Atlantic Way and near the Cliffs of Moher and Aran Islands, so it’s not unknown to experience an Atlantic breeze or a downpour throughout the day. Depending on the time of year, daylight varies from 5am to 11pm in the summer, to 8am to 4.30pm in the winter. Temperatures don’t vary greatly, at 4-18C (winter – summer) – so be sure to bring a waterproof jacket, warm sweater and a good pair of boots – you’ll need them for exploring our great outdoors and capturing those all-important snaps for your photo album or Instagram feed.